The Royal South Street Society uses the personal information you provide for the purpose of competition only. Information is not used or passed on to any other organisation for any purpose. All entry fees are inclusive of GST where applicable. The information contained in this Schedule was current as 16 MARCH 2018. The Royal South Street Society reserves the right to alter if the situation arises; sections, conditions, prizes, dates, locations, sponsors, adjudicators etc. The final competition information will be published in the discipline Guidebooks prior to the commencement of the competition in 2018. Our mission is to conduct Australiaâ&#x20AC;&#x2122;s foremost Eisteddfod, promoting, fostering and encouraging participation and interest in the performing arts. 2019 Tentative Timetable Please note: this is tentative timetable and The Royal South Street Society reserve the right to make changes at any stage. 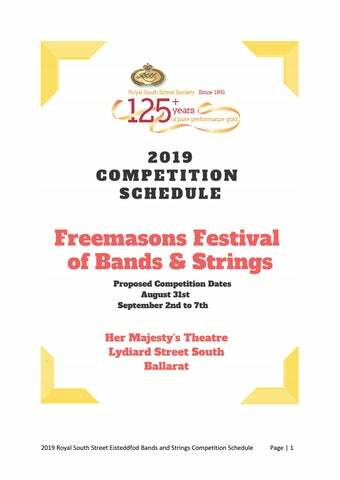 FREEMASONS VICTORIA FESTIVAL OF BANDS & STRINGS VENUE: Her Majesty Theatre, Lydiard St, Ballarat SECTION CHAIR: Brain McInnis Our appreciation is extended to Freemasons Victoria for their support. SPECIAL CONDITIONS To be read in conjunction with General Conditions. 1. The Conductor is NOT to play with his or her orchestra or group. Open age sections and Stage Band sections accepted. In sections that have a maximum number of players specified, not more than 2 players may be interchanged between items, but the maximum number of players must not be exceeded on stage at any time. Competitors not to repeat an item in another section. (See General Rule 1.5). Own accompanist must be provided. (See General Rule 5.1). Acoustic music only permitted. If warm-up room is not available, bands allowed 5 minutes warm up on stage. Band must remain in position set, prior to rise of curtain. Percussion ensembles MUST use equipment supplied but may add to existing list. In Concert Band section 830, 831, 832, 833, 834 schools may choose the section they enter. Section 834 is only open to bands that play at an elite level. A selection process for this section will take place. Players must be currently attending the school for which they enter. Age limit 20 years. Schools may interchange no more than 6 players between two groups. i.e. 6 players may play for a Junior Band and a Senior Band in two sections or Junior or Intermediate, or Intermediate and Senior, etc. Small schools that have difficulty in forming a band may combine with neighbouring schools, but this combined band must practise at least weekly during the year. ANY SCHOOL NOT COMPLYING WITH THE ABOVE RULE MAY NOT BE PERMITTED TO PERFORM. All musical directors must ensure that when submitting their scores that instruments not present as marked on the score are to be blacked out for the entirety of that score. All scores presented â&#x20AC;&#x153;shouldâ&#x20AC;? be double side printed. The head of music from each school must submit a signed declaration that competing students are currently attending the school for which they are competing. 9. V.C.E. Students may enter more than once in a VCE solo section as long as they play a different instrument for each entry. Instrument to be played must be included on each entry form. Where VCE Groups may enter more than once in a VCE group section the same instrument may be played. Teachers are permitted to play in this section. A detailed list of all percussion instruments provided will be sent to all schools and available on our website. Ensemble competitors will not be permitted to substitute any of the supplied instruments with their own, but may add to the kit if necessary. Note that VCE entries will be run as per VCAA Guidelines. TIMING. All competitors will be timed as per the maximum time limit mentioned in each section. All time limits are ON STAGE TIME. (Time starts when programme commences and concludes at the end of the performance). Excess performance of more than 2 minutes may result in exclusion from receiving a prize/award. The decision will be at the discretion of the adjudicator. All bands, orchestras or combinations of more than 12, players must provide ONE set up person responsible for the stage set up per item played. EXEMPTION FROM PERFORMANCE CRITERIA Any Concert Bands that wish to play a major work may apply for an exemption of their performance criteria relating to both parts of section 833 the Senior Concert Bands section only. For applications to be considered performance time must be a minimum of 15 minutes. Requests must be forwarded in writing with a copy of the score no later than Friday, July 12th Schools must choose from the lists provided, but are advised to carefully select their pieces and ensure special condition 14 is adhered to. Schools must choose sections they enter carefully to ensure that in the opinion of the adjudicators there is no advantage and even competition is conducted. NOVICE: A novice band is made up of beginning students who have been learning their instrument no longer than 18 months. Stage Bands: 1 solo microphone is available during stage bands for use. PLEASE NOTE: Sound levels will not be monitored or adjusted during performances. Schools are to indicate the use of this microphone on their instrument list provided for each performance. AUDIENCE School educational groups of 10 or more, for a fee of $2 per student, may be part of the audience, providing they are effectively supervised and attired in School Uniform. Students that are playing in an evening session would need to be registered as a school group and pay to be a part of the audience in an afternoon session. Prior arrangement for these education group bookings must be made with the RSSS office. Age limit will be deemed as at the 1st January of the current year. In sections where there are two adjudicators, one will prepare a written critique, whilst the other will provide a recorded comment. 839 JOHN CHENERY NOVICE/JUNIOR PERCUSSION ENSEMBLE 19 Years and Under Minimum 4 players, Maximum 14 players. Refer to Special Condition 15 for definition of novice. Time Limit: Maximum 12 Minutes. If only 4 players they all must play percussion instruments. Other non-percussion instruments are permitted, providing, keyboard or bass guitar is only accompanying the ensemble. N.B: The ensemble must provide proper cables and plugs with a current test and tag certificate. Schools must supply a list of electronic equipment to be amplified to RSSS one month prior to the competition. Other Instruments may be used only to give a percussion sound. Please submit a list of instruments to be played to Royal South Street one month before date of competition. First Shield & Plaque; Second & Third Plaques. Entry $70 The John Chenery Novice Shield will remain the property of RSSS. 840 JOHN CHENERY SENIOR PERCUSSION ENSEMBLE 19 Years and Under Minimum 4 players, Maximum 14 players. Time Limit: Maximum 15 Minutes. Other non-percussion instruments are permitted, providing, keyboard or bass guitar is only accompanying the ensemble. N.B: The ensemble must provide proper cables and plugs with a current test and tag certificate. Schools must supply a list of electronic equipment to RSSS one month prior to the competition. Please submit a list of instruments to be played to Royal South Street one week before date of competition. First Shield & Plaque; Second & Third Plaques Entry $90 The John Chenery Shield will remain the property of RSSS.